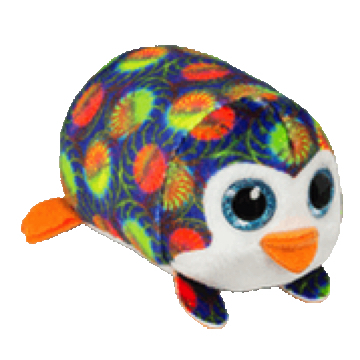 Pocket is a tiny dark blue penguin covered in a red and yellow swirly pattern. He has blue glittery button eyes and an orange beak on a white face. His tiny feet are bright orange. Pocket was released on 26th March 2019. His Birthday is on 19th August. Pocket is part of the McDonalds Teeny Tys range that was released for the 40th Anniversary of the Happy Meal. The three variations of Pocket are this dark blue version with blue eyes, a black version with purple eyes, and a bubble pattern version with green eyes. The McDonalds Teeny Ty version of Pocket is not to be confused with the regular Teeny Ty of the same name.